From the past several years, people know the benefits of food dehydration, and now you can do this process quite easily sitting at your home. Lots of companies in the world are manufacturing high-grade food dehydrators which can be either use for commercial or domestic use. One of the newly launched food dehydrators which are gaining popularity in the market is L'Equipe 528 6 Tray Food Dehydrator. L'Equipe 528 6 Tray Food Dehydrator allows you to do dehydration of food in a quite safe manner. In fact with this fantastic appliance, you can enjoy your winter fruits in the months of summer periods. Some people have a misconception in their mind that after drying out the fruits and vegetables, their nutrients and vitamins get vanished. But, that’s not true at all. L'Equipe 528 6 Tray Food Dehydrator retains all the beneficial vitamins and nutrients as well as the delicious taste of any food with the help of sufficient temperature of heat. This alliance has an exclusive design and price which can attract any person’s attention. Even, if the price of the dehydrator is low but it can compete with any costly food dehydrators which are available in the market. If you have not bought any food dehydrator yet, then this appliance will be a good option for you. In the below article, we will review about the L'Equipe 528 6 Tray Food Dehydrator, 500-watt along with its pros and cons, so that you can get well-familiar with the product before buying. The L'Equipe 528 6 Tray Food Dehydrator designed along with a high power fan as well as a heater that located at the base of the appliance. Inside the dehydrator, the hot air flow﻿s upward uniformly all over the entire trays. As a result, there is no need to open this dehydrator recurrently for rotating the trays so that the heat distributes evenly. It also takes very less time for drying out the fruits and vegetables entirely. 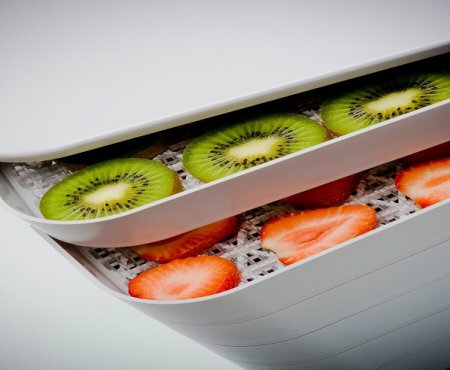 In the L'Equipe 528 6 Tray Food Dehydrator, you will get the total drying space of 7.2 sq. ft. (6 trays). However, you also have the option of adding six more trays which will increase the drying area up to 14.4 sq. ft. The expandability is only required if you want to dry out large size batches of the food. It provides you a silent operation during the process of food dehydration. Thus, if you are thinking to use it during the night time, then you can go on worries without disturbing the sleep of your other house members. One of the most important features of the L'Equipe 528 6 Tray Food Dehydrator is the easiness to use. You can just operate this appliance without much guidance and help. In fact, if you are a beginner or a novice user then also you will not find it difficult to operate. This food dehydrator is very compact﻿﻿ as well as lightweight so that you can place it on any kitchen size countertop without much trouble. Nowadays, people have an issue of space in their homes and kitchen, but with this appliance, you will not face such problem. 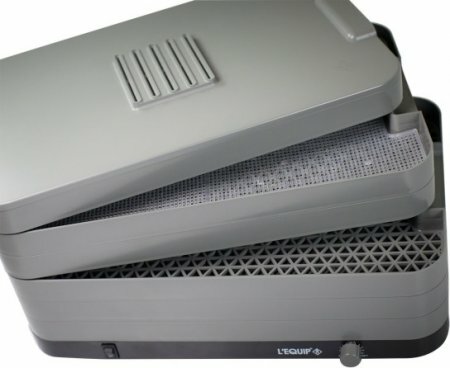 The plastic case of the food dehydrator is also made up from the BPA-free material. It means the cooking of food in this appliance is not harmful to health at all. The L'Equipe 528 6 Tray Food Dehydrator possess the wattage power capacity of 500-watt which is optimum for drying flowers, vegetables, and herbs. A fan also gave at the bottom side of the faster drying process. The air flows from bottom to top in the appliance. The appliance possesses the feature of adjustable thermostat along with the computer-controlled sensor which regulates the heat between 93º - 153º F.
The manufacturer of the dehydrator provides six stacking trays along with the product. But you can increase the number of trays up to 12 if required. It is a stackable﻿ food dehydrator in which racks provided for drying out the food. The fan is located on the bottom of such dehydrators normally. Along with the L'Equipe 528 6 Tray Food Dehydrator, you will get an additional booklet which instructs about the recipes and the time required for drying the different food item. The manufacturers of the L'Equipe 528 6 Tray Food Dehydrator offer the buyers a 10-year limited warranty period which is quite good. The size of each tray is 17” x 11” which provides a drying space of 1.2 sq. Ft. approximately. It means you will get the total dehydrating area of 7.2 sq. Ft. which is quite enough. The appliance manufactured from the BPA free plastic which is very safe for the health of the human beings. The dimension of L'Equipe 528 6 Tray Food Dehydrator is 17 (W) x 11-4/5 (D) x 10-1/2 (H) inches. This rectangular shape food dehydrator has the weight of 11 pounds which is quite lightweight to carry from one place to another. The fan of the L'Equipe 528 6 Tray Food Dehydrator 500-watt operates quietly. Such feature is not available in many expensive food dehydrators these days. Thus, if you are looking for the appliance which does not disturb the night sleep of your family members, then this dehydrator will solve your purpose. L'Equipe 528 6 Tray Food Dehydrator 500-watt is a different rectangular food dehydrator which is also lightweight to carry. The compact design of the machine makes it get fitted in nay corner of your kitchen easily. In this appliance, you will get the feature of adjustable computer controlled temperature sensor which helps in drying out your food item quite cautiously at the right temperature. Again, you will not find this feature in many costly food dehydrators. The trays of the food dehydrator can taken out quickly, and you can wash them in the sink of your kitchen. When the trays are warm, you can wipe the residual material quite quickly from the corners. The plastic used in manufacturing the appliance is BPA free. It means you can use this machine for drying purposes without any issue. It is non-harmful to your health. A dedicated ON/OFF switch is given in the appliance for the more convenience of the user so that they can use the power of the product when they need. It is also very easy to use this appliance as no much guidance required for operating it even for the first time. This food dehydrator is also economical to buy. At such reasonable price, no company will offer you a food dehydrator along with all the innovative hi-tech features. In all aspects, it can compete easily with all the expensive dehydrators which are available in the market. I hope after knowing the best things about the L'Equipe 528 6 Tray Food Dehydrator 500-watt, now you have make-up your mind for buying this product. There are few drawbacks regarding this appliance which you should also know. These drawbacks will not discard the overall benefits of buying the product, but I think you should be acquainted with them before making any wise decision. If you need more additional trays for increasing the expandability of the food dehydrator, then you will be disappointed to know that such trays are very costly to buy. As compare to the cost of the dehydrator, such extra costs seem to be a burden on any buyer who has huge requirement of dried food. The base configuration of all the six trays is also smaller if you need to dehydrate food for a big get-together. You cannot keep much food on every single tray. In this food dehydrator, you will not get any timer. It is the main drawback of the appliance. So, if you had a busy, hectic schedule and didn't get time to look after the process of dehydration, then the absence of timer might not be useful for you. 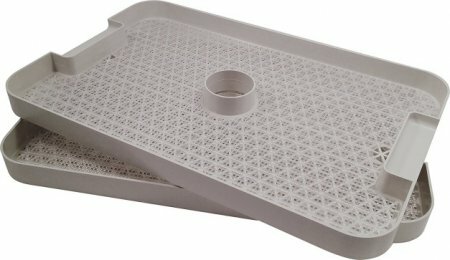 The trays of the L'Equipe 528 6 Tray Food Dehydrator, 500-watt are not dishwasher safe. Thus, you have to clean it with your hands in the sink of your kitchen. Thus, the cleaning process is the little bit time also consuming as you have to do it yourself. Q: Does the Thermostat of the L'Equipe 528 6 Tray Food Dehydrator 500-watt Is Adjustable or Fixed? Well! This appliance has a feature of an adjustable thermostat which regulates the temperature between 93º - 153º F.
Q: Does the Trays of the Food Dehydrator Are Dishwasher Safe? According to the product specifications about the appliance, the trays of the food dehydrator are not dishwasher safe. Thus, you have to ﻿﻿clean ﻿﻿them up with your hands in the sink of the kitchen. Q: Who Is the Manufacturer of the L'Equipe 528 6 Tray Food Dehydrator? 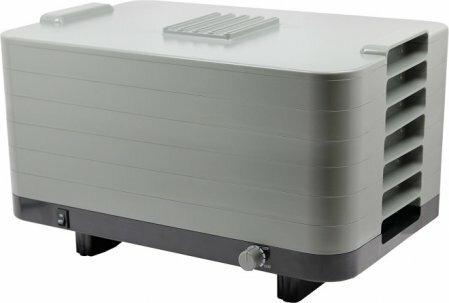 This food dehydrator manufactured by the famous "Lequip” company which belongs to South Korea. Q: I Am Thinking to Buy a Food Dehydrator but Does This Appliance Have a Timer in It? You will not get any timer in L'Equipe 528 6 Tray Food Dehydrator. But of you still need a timer, then you should go for another timer from the market. It will suffice your purposefully. Q: Can I Cook a Jerky in This Food Dehydrator? Yes, you can cook jerky in this food dehydrator. For more assistance, you should check the time and temperature required for cooking jerky. Q: I Want to Buy a BPA Free Plastic Food Dehydrator That Does Not Harm the Health of My Family Members. Does the L'Equipe 528 6 Tray Food Dehydrator Have This Feature in It? The body of this food dehydrator is made up from BPA free material which will not harm your health at all. Thus, you can buy this product without any worries. Q: Do the Shelves of the Food Dehydrator Made Up of Stainless Steel? No, the trays of the appliance formed from the plastic material along with the plastic mesh sheets. Q: Can I Use the Parchment Paper in Place of a Liner so That the Seeds of the Peppers Do Not Get Fall Over? You might use a parchment paper. However, the manufacturer of the product says regarding using the trays that while making fruit leather you should leave either side of the tray open so that the air can flow smoothly. Q: from Which Material the Trays Manufactured? The trays manufactured from ABS plastic material. Q: What Benefit Will I Get with the Ten-year Limited Period Warranty Offer on the Food Dehydrator? The L'Equipe 528 6 Tray Food Dehydrator provide its buyers ten years period of warranty which covers the replacement of the appliance and its parts in case of any defect in manufacturing. There are very fewer companies which offer so much longer period of warranty usually. Q: Where Does the Fan in the Food Dehydrator Locate? The fan is located at the bottom of the appliance so that air can flow quickly and evenly from bottom to top. Q: Will I get six mesh screens, six full-size trays, two fruit leather trays and instruction book along with the recipes along with this food dehydrator? Yes, all the above things provided along with the product. However, if you need to buy anything extra, then you can buy from any online shopping websites at a reasonable price. Q: Does the Fan of the L'Equipe 528 6 Tray Food Dehydrator Located at the Back Side? No, the fan of this appliance is located on the bottom side so that the air flows from bottom to top effortlessly. Q: How Many Hours Will It Take to Dry Herbs in This Food Dehydrator? It will take around 13 hours for drying herbs in this machine. But it varies along with the quality and the quantity of the food you are drying. Q: Can I use the L'Equipe 528 6 Tray Food Dehydrator to dehydrate fresh fish? It will be good if you dry out a freeze-fish because fresh fish will get dry very quickly and this might hamper the taste of the food also. Q: Do the Components of the Appliance Made Up of Plastic Material? Yes, the parts of the food dehydrator formed from the plastic material which is quite sturdy and easy to clean. Q: Does L'Equipe 528 6 Tray Food Dehydrator Come with the Acetate Sheets? The food dehydrator comes with one plastic round sheet which gets fits flawlessly and completely shields a tray. But we can't comment that from which material that is made up. Q: What Is the Temperature Range of the L'Equipe 528 6 Tray Food Dehydrator? The temperature range of this appliance is 93 degrees F to 153 degrees F. It means you can dry out two varieties of food in it i.e. hard like jerky and subtle like herbs. Q: Will I Get Mesh Screens and Fruit Leather Trays along with the Product? Yes, you will get all these things, but if you want to buy more then, you can ask the manufacturer for that. Q: Will This Machine Able to Make Granola? Yes, it will surely make granola. You should try that once. Q: Does the Motor of the Appliance Is Protected for Safety Against Drippings as Well as a Liquid? The food does not get to the place where the motor located. So, I think you should not worry about its safety also. Q: Do the Plastic Parts of the Food Dehydrator Touch the Food? No, the plastic part does not touch the food, but only grid area reaches that. Q: What Is the Size of the Trays of L'Equipe 528 6 Tray Food Dehydrator and How Much Drying Space Will It Provide? The size of every single tray is 17” x 11” which provides a dehydrating space of 1.2 sq. Ft. approximately. That means you will get the total dehydrating area of 7.2 sq. Ft. which is quite adequate. Q: Do the Trays of the Appliance Slide Out? Will They Stack on Each Other? Yes, the trays can stack up on each other quite simply. A clip gave over the edges which allow the trays to stack steadily and securely. Q: What Is the Weight of the L'Equipe 528 6 Tray Food Dehydrator? This appliance has the weight of 11 pounds which makes it quite a lightweight product for carrying it from one place to another. Q: Can We Dehydrate Food Items Like Kale and Moringa into the Form of Powders? I think you can try that. User have used it for drying icing ingredients. Q: How Many Controls Does the L'Equipe 528 6 Tray Food Dehydrator Have? This food dehydrator has two controls i.e. a temperature control knob as well as an ON / OFF switch which helps you a lot in the drying process. Q: Can I Easily Clean the Bottom of the Machine If Something Gets Dropped? Yes, you can simply wipe it off with a cloth. Q: I Want to Use the L'Equipe 528 6 Tray Food Dehydrator for Drying Sprouted Grain. Will That Be Possible? Yes, you can dry out the sprouted grain in this appliance without any much difficulty. Q: What Is the Power Wattage of the Food Dehydrator? As the product specifications indicate, this appliance has the power capacity of 500 watts which is quite enough for drying fruits and vegetables. Q: What Are the Actual Dimensions of the L'Equipe 528 6 Tray Food Dehydrator? The real size of the L'Equipe 528 6 Tray Food Dehydrator is 17 (W) x 11-4/5 (D) x 10-1/2 (H) inches. At last, we want to say that the L'Equipe 528 6 Tray Food Dehydrator 500-watt is just perfect for any person who is looking to buy a cheap, compact and lightweight appliance for their kitchen. It is a multipurpose food dehydrator which equipped with all the specialized features. As compare to the price of the appliance, it is worth to buy a product. It offers a great value as far as we reviewed. We delightedly recommend L'Equipe 528 6 Tray Food Dehydrator 500-watt to both users i.e. first timers as well as who want to replace their old one with this innovative product. Thus, if you are looking to buy a food dehydrator for the first time, this will be a good option to opt. L'Equipe 528 6 Tray Food Dehydrator 500-watt is available at numerous online shopping websites like Amazon at very reasonable price rate. After adding this outstanding appliance in your kitchen, you will surely get amazed with its benefits for the longer period. If you want to know more about this food dehydrator, you can only write to us or comment in the box given below. We will surely answer your query.